Are We Ready for a Future with Fewer Surprises? That was a brave public moment for Sen. Warren. The popular discourse on parenthood in the United States has entered a bizarre stage largely devoid of science (e.g., biology, genetics, demography). 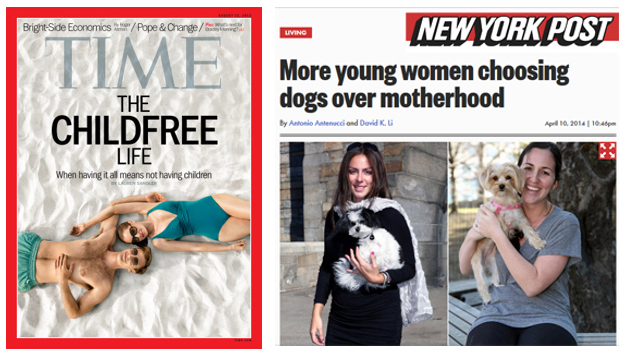 Parents, especially those with multiple children, have earned the moniker “breeder” for their overpopulating of the planet; “unintended” pregnancies, like Sen. Warren, are now assumed to be unwanted and something that needs to be discouraged as a public policy; and there is even a growing Childfree Movement. Hymas focuses here on one set of potential consequences and seems not to understand the internal dynamics of the population growth we are experiencing (...like many others). Concerns about overpopulation are very real. We’re likely headed toward more than 10 billion people on the planet by the end of the century and we need to figure out how to produce enough food and energy for them. But babies are no longer the primary concern. You, me, and Lisa Hymas are! Globally, fertility (i.e., average number of births per woman over her lifetime) has been falling for decades (from 4.98 children per woman in 1960 to 2.47 in 2012). 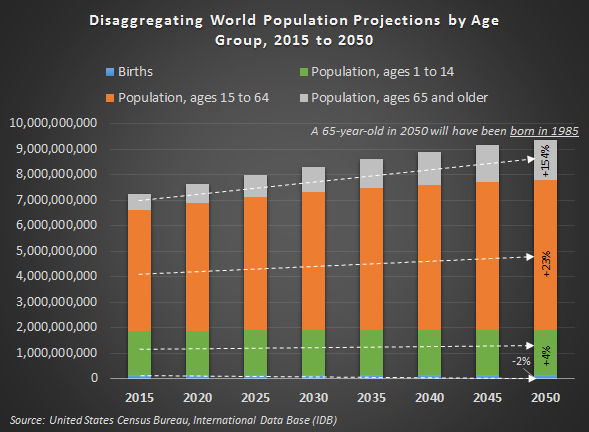 The increases leading to the “overpopulation” so many fear in the near future will be driven by those who have already been born living longer than people have in the past. As shown below, the Census Bureau expects the global senior population (ages 65 and older) to increase from about 617,097,000 now to 1,565,844,000 in 2050. That is growth of 154 percent in just 35 years. The annual number of births worldwide is actually expected to decline during this period by 2 percent numbering just over 130,000,000 each year. In 2000, without notice or ceremony, the world reached an important milestone: “peak childhood.” There were no big news announcements or parades but it happened. From then to now and into the future we can expect there to be about 1.9 billion children (under age 15) around the world at any time. Yet, if the world pushes fertility rates even lower (...press play on the graphic below to see how we got here) we will enter a strange period in human history in which we will take steps toward living with an “inverted population pyramid” where there are many seniors and few children. In the quest to reduce “overpopulation” many suggest we need to squeeze the bottom of the population pyramid even further without fully realizing the complete consequences of that suggestion. I certainly don’t think anyone should ever be pressured to have children (e.g., the Ceaușescu regime in Romania). It is also regrettable when states prevent those who seek to be parents from having the children they want (e.g., the One-child Policy in China). Openness to children is a deeply personal decision with many factors to consider. Some feel they should never be parents for a variety of perfectly valid reasons. Others want desperately to have a child but biologically cannot do so. This post in no way implies that any person or couple “needs” to have kids (...if you are a childfree enthusiast reading this you can now put away your breeder bingo card). However, it does accept the scientific reality that no species can survive without sufficient reproduction collectively. Humans have always experienced periodic population declines. But historically these have come as a result of disasters, disease, and sometimes war. These circumstances often kill without or with little discrimination. All sectors of society are reduced in number. What many countries around the world now experience is selective population reduction. The young are disappearing (i.e., never being conceived) as the old grow in number with extended life expectancies. These circumstances make the economics of the modern state’s social safety net increasingly difficult and perhaps eventually impossible. Most advanced industrial countries rely on state programs to assist their elderly populations with income and health care after retirement. These are paid for by taxing the younger currently employed workers (…your deductions do not go into a “lock box” with your name on it!). If each generation decides to have fewer children than the last, eventually there are too few workers per retiree. The drop in fertility in advanced industrial economies is “the deficit behind the deficit” and if current trends continue this will only grow more problematic. The country out ahead of any other on this path is Japan. 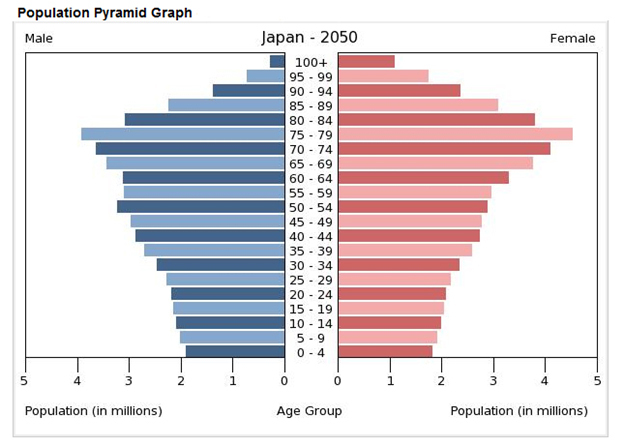 As you can see below in this country’s projected population pyramid for 2050, Japan is coming closest to dealing with the many challenges of an inverted “graying” pyramid. The effects of fertility decline are not just limited to the state budget and care for seniors. A future of fewer people year-over-year will also be one of perpetual economic stagnation or recession for all. Currently it costs a middle class family $245,340 to raise a single child to the age of 18 in the United States. If a couple has two kids that’s close to half a million dollars they inject into the economy. A skeptic might say they would have just spent that money on something else if they had no children. Perhaps but as most parents know having a child can “encourage” you seek out more income out of necessity (e.g., dads, on average, make more than non-dads and the combined incomes of a mom and dad outpace a couple with no children). As I write Japan is again in a recession. Downturns and anemic growth have become the normal way of life there for decades and will be so for the foreseeable future until they begin to grow demographically again (innovations and exports have been insufficient). During the Baby Boom of the 1950s and 1960s the United States had one of its highest ratios of non-workers per employed. But a sizable portion of these non-workers were children and parents bore most of the costs of their care and upbringing. The country now faces another growth spurt in dependents in the Senior Boom and their children, too few in number or non-existent, will struggle to pay the bills. One could argue that those who are going through life today without contributing to the replacement of their generation by either having children or assisting in the care and upbringing of those children (e.g., adopting, personally caring for, educating, or directly financially supporting) are shirking or free riding the system (…the same way many young adults were free riding the health care system before the individual mandate required them to purchase health insurance). Sure the childfree who contribute nothing to the “breeding” process will still get taxes taken out of their checks too as they work but they don’t provide enough, if at all, to producing the next generation who will pay for their Social Security and Medicare. When countries don’t have a sufficient number of children to replace their elders they often choose to import population (…or turn to robot caregivers and workers? See Japan 1, 2). Without robust immigration in recent decades the United States would be headed down a difficult path similar to Germany or Italy and perhaps eventually to the crippling realities faced by Japan and Russia. The U.S. needs to have immigrants always wanting to come here (a luxury Russia can’t count on). One advantage of this is that individuals coming from developing countries often bring with them higher fertility rates, at least for a generation, that make up for sub-replacement rate fertility among citizens. However, this is an incomplete solution to the complex problems created by low fertility as immigrants most often arrive during their working years. All of the spending on raising them by their parents when they were children (and the associated opportunities to collect tax revenue on this) was done in other countries. For the Catholic Church in the United States, immigration has historically meant more Catholics but immigration doesn’t increase population on a global scale. If Catholics move from one country to another there are still the same number of Catholics in the world! However, declining fertility will mean that the Church will have fewer global births and this leads to fewer global baptisms. We can already see this beginning to happen. 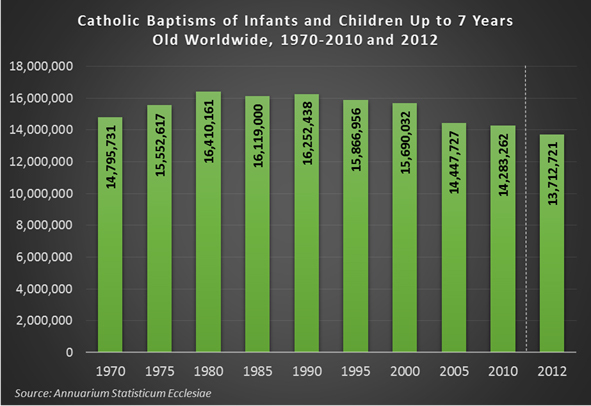 As shown below, fewer infants and children were baptized in the Church worldwide in 2012 than in 1970. The Catholic Church gets a lot of criticism for its teachings on married couples being open to the possibility of having children. That may not always be the case in the future (especially for countries unable or unwilling to turn to immigration). Some are already implementing public policies to try to encourage their citizens to have more children. In Russia they celebrate a national holiday called the “Day of Conception.” Couples who have a baby exactly nine months later win prizes. Russians also can receive payments of thousands of dollars per child throughout the year. In Japan the state is playing matchmaker and spending nearly $33 million hosting parties where young people can meet and begin relationships. In South Korea, “family day” was instituted by the Ministry of Health. They turn their lights off at 7 pm on the third Wednesday of each month so employees can spend more time creating “bigger families.” In Singapore they created an ad campaign that included the following line, “I’m a patriotic husband, you’re my patriotic wife, let’s do our civic duty and manufacture life.” They are limiting the construction of small one bedroom apartments and provide tens of thousands of dollars for each child born in addition to providing tax incentives and parental leave. As the Catholic Church focuses this year on the family it must grapple with the fact that family is just simply becoming less common all together. Where it does exist, it most often now includes fewer people. 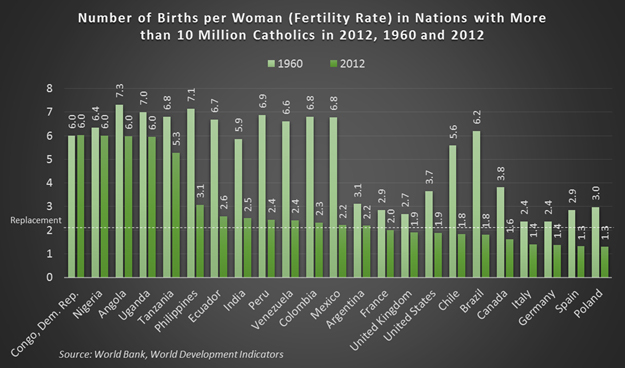 As shown below the fertility rate is falling in most countries with the largest Catholic populations (i.e., at least 10 million in 2012). The average fertility rate in these countries was 5.2 in 1960 and is now 2.9. In 43% of these 23 countries the fertility rate is now below replacement level (i.e., 2.1; the rate at which parents replace themselves in the population). Looking at the right side of the figure above, Germany is experiencing population decline—even with immigration and in Italy, deaths now outnumber births. If current trends continue, things will only get worse for both countries. 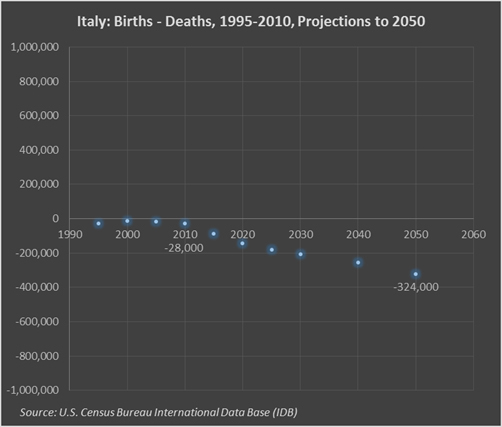 As shown below, Italy is headed for net natural population losses in the hundreds of thousands in the decades ahead. The Italian fertility rate is currently only 1.4. In the long-run Italy must raise this rate or face a persistent diminishing population. Take the simplest example of a closed society model (i.e., no immigration) of 100 people of child bearing age (50 male and 50 female) and a fertility rate of 1.0. At most, the next generation might be expected to include 50 individuals. If this generation maintains the 1.0 fertility rate, the next generation would likely include 25 individuals. Assuming this society practices monogamy and continues at the same fertility rate, the next generation could have 12 individuals. The following would have six, then three, then one, and then extinction. From 100 to none in seven generations at a 1.0 rate. In more realistic big population models the math extends on a significantly longer timeline (i.e., 25+ generations) but nonetheless ends in the same dismal place without an increase in fertility at some point. It is the case that women (and men) in the United States continue to say in surveys that they want to hypothetically have about two kids, on average. But people are waiting longer to marry and longer to have children after marriage. There are relatively inescapable biological realities that do not necessarily conform to changing preferences about when to have a baby in one’s life-cycle. Some will reach the point where it becomes difficult, dangerous, or impossible to have children without ever reaching their goal of having the two kids and there aren’t enough Americans having three, four, five, or more children families to make up for those who do not have any children or have only one. According to the Guttmacher Institute, more than half of pregnancies in the United States are “unintended.” For many, “unintended” is not an equivalent of “unwanted.” Not every surprise ends in the stereotypes of the parenting debates of the day. However, it is the case that the Department of Health and Human Services has set a policy goal of reducing unintended pregnancies by 10% before 2020. If achieved, this would drive the U.S. fertility rate even lower below the replacement rate (currently 1.87 births per woman). In the macro view, public policies that aim to drive fertility rates well below replacement levels are inherently risky. If successful, these put so many other government programs in danger of becoming unsustainable by constantly downsizing the next generation of workers and taxpayers who will support the ever growing top of the population pyramid. I also fear the eventual development of a political cleavage at the other end of the population pyramid. What happens when a society can no longer afford to care for its senior population? Perhaps this is the question that the the Millennial Generation will have to face as seniors. It will not help that they are saving virtually nothing for their later years (1, 2). Will society turn on the Millennials in the decades ahead and encourage “compassionate euthanasia” before they face disability or serious medical problems? Will we ration senior medical care even further or increase taxes on medical research and development so fewer new therapies and cures will lead people to live even longer? The Catholic Church is often portrayed as a backward “stuck in history” institution. Yet, when it comes to fostering a culture of openness to children and asking many important end of life questions it may play an even more important role in the future than we might think now in 2014. I’m not saying that as a Catholic. I note this as a social scientist who looks honestly at the demography and economics of the future and wonders how we will manage what we are creating now. Depending on where you live you may be able to get a view of the future now. Next time you are at the local grocery store look at the pet products aisle and the baby products aisle. Which is bigger? If it is the pet aisle welcome to the future! You already live there. I certainly have nothing against pets. The generosity and care “pet parents” provide for their companions is commendable. But when you are old your golden retriever won’t inject you with insulin or carry you up the stairs. In fact, your dog will be dead (...after leaving quite a sizable carbon paw print on the environment). Sorry. I didn’t mean for this post to end like Marley & Me. At the same time if we aren’t open to a few more “surprises” this century we’ll have many sad endings to work our way out of other than the possibility of rising oceans. The future is far more complex than our current political debates. There is more to fear than your thermometer. That is not theology nor doctrine talking. That’s science and another, less well known, inconvenient truth facing us.